Strong and supportive off-the-shelf option for contact sports with added ACL support via the FourcePoint Hinge. Is the Armor with FourcePoint Hinge right for me? Supportive knee brace for individuals with knee ligament instabilities and athletes involved in extreme or contact sports. Still not sure? Try our Brace Advisor for personalized product recommendations to meet your needs! *Note: this product is NOT recommended for PCL injuries or instabilities. This patented technology was developed to reduce the strain on the ACL by distributing the load placed on the ligament via four points.Click here to learn how the Four-Points of Leverage works. Reduces the amount of time your knee is in an "at risk position", enhances the Four-Points of Leverage by increasing the posterior load applied by the brace on the tibia, and improves your natural gait by applying progressive resistance before reaching a firm end point during movement. DonJoy has taken hinge design and ACL protection to another level with its patented FourcePoint technology. Note: The Ski Hinge is soon-to-be discontinued. The Armor Hinge offers the same protection. Select a short calf length if using for skiing or snowboarding. Get the strongest, most supportive knee brace for skiing, without a prescription. The Armor Knee with Fourcepoint Hinge has excellent, updated features that make this knee brace worth purchasing without missing features from the soon-to-be discontinued Armor Ski Knee Brace or Armor with Ski Hinge. The updated Armor Knee with Fourcepoint Hinge offers a low-profile fourcepoint hinge that's flush with the frame, so it can be easily worn under your snow pants, and is light so it won't weigh you down on the slopes. 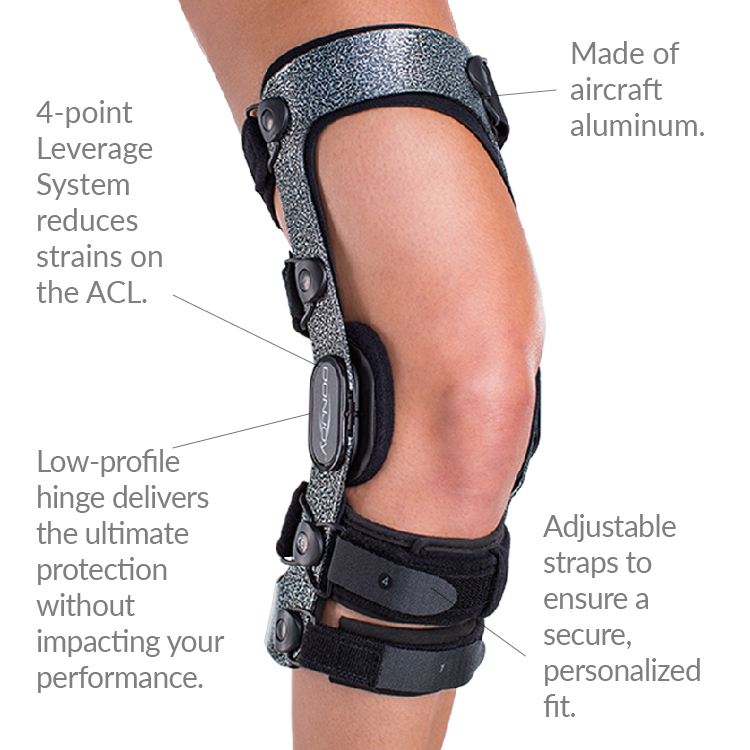 The low-profile hinge reduces the need for the deflector while still providing protection for ACL, MCL, LCL or Meniscus instabilities, which prevents the hinge from from "getting hooked" with other braces or knee. Designed with internal strap tabs to reduce the risk of the tabs breaking and delivers comfort and security when in motion. The Armor Knee is available in short or standard calf sizes, so you can choose the length you need for a more customizable fit-and it won't interfere with your ski boot. The DonJoy Armor knee brace with FourcePoint Hinge Technology is the brace to use if you are an extremely active individual or athlete who suffers from an ACL or MCL instability or injury. Offering the same features as the standard Armor brace, this model is equipped with FourcePoint hinge technology - clinically proven to provide additional ACL protection by reducing the time spent near full extension (otherwise known as the "at risk" position). The hinge enhances DonJoy's 4-Points-of-Leverage System by dampening knee extension, and reducing shear forces at the knee. The Armor brace is the strongest and most supportive brace you can get without a prescription. If you are concerned about protecting your ACL during sports or high impact activities, the Armor knee brace with FourcePoint Hinge Technology is the best brace for your needs. Our low profile hinge combined with our internally mounted straps promote bilateral use that won't impede performance. The steel reinforced hinge plate and enhanced aluminium frame deliver uncompromised strength and proven protection. There are numerous publications to support the 4-Points-of-Leverage FourcePoint hinge. This brace is suited for any active individuals with ligament instabilities and athletes involved in extreme or contact sports brace like football, skiing, snowboarding, motorcross, surfing, wakeboarding, and more. Instructions for Use...how to put on your DonJoy Armor Knee Brace. Shop DonJoy Armor Replacement Parts for strap kits, condyle pads and more. Shop our complete selection of knee support or browse additional DonJoy products. As a football player with an ACL injury the Armor with FourcePoint Hinge is the best brace. This is because the Fourcepoint hinge is specially designed for ACL injuries to help decrease stress on that ligament. As well the armor is our thickest off the shelf brace with a thicker aluminum. Where is the size shown on the brace? I want the same size but can't find it shown on the braces we have. You can locate the size of your brace on the black thigh liner. Remove the thigh liner and you will see white letters on the back indicating your size. Hello I'm trying to figure out what size I should order. My measurements is; above knee:24 inches center knee:16 1/2 below knee:17 1/2 . I know these measurements sit in between L and XL but I wanted to know from the professional . Cause o don't want it to be loose nor tight. Please help. Thank you. Based on those measurements we would suggest a size Large. Have had torn meniscus tears on both inner and outer parts of my left knee. May left leg is my stress leg. I need something that will give strong support to this knee to prevent pain after walking on a tread mill. I also have mild OA in this knee so I in addition I need a brace that will help with this. My 15 y/o daughter tore her ACL playing soccer last August and had surgery in Sept. She has the Donjoy Armour brace. She has started practicing and skills with soccer and just went back to also practicing for beach volleyball. She wears her brace in the sand because, well it's sand and we don't want to risk her twisting it. What is the best way to keep it clean after as it seems to get full of sand, and she will need it within the next month when she starts playing in soccer games. To keep your Donjoy Armor Knee Brace clean, it is best to rinse it with fresh water, to remove any debris from the hinge. I am barely 5' tall and my legs aren't the longest. I'm curious about the short calf option? What are the measurement differences? And is this a good idea? We recommend the 4titude for anyone shorter than 5'3. Its the shortest brace available at 14" in length. https://www.betterbraces.com/donjoy-4titude-knee-brace The Armor with the short calf option is 15" in length. I have the armour knee brace with fourcepoint hinge and I use it for soccer, I was wondering if there is anyway to keep it from sliding down my leg. Hi, I am currently looking for a brace to best support my knee in which I tore my ACL. Ideally, I would like to play soccer. Which brace would you recommend? i am looking to buy the armour brace with fourcepoint hinge. i called the canadian phone number and they told me they dont sell direct. i am wondering if i can order this brace on the better braces website? I had acl reconstruction 11 months ago and I play softball. I have been looking at braces for the season and I'm not sure which would be best. I also do a little skiing in the winter. I'm just looking for a brace that would give me the best protection. The best option is the Defiance Custom knee brace as the fit is better since it is made just for your knee. The best "off-the-shelf" option is the Don Joy Armor with fourcepoint hinge. Both braces offer the same support and with the short calf option can be used for sking as well as softball. The warranty on frame and hinges for the Defiance is lifetime ans the Armors warranty is one year. The pictures to the left of the price at the top of the page seem to differ from the picture in the Product Description....mainly top pictures show a smooth frame, the product description shows hinges ON the frame..... which is the correct brace? I have twin daughters who play competive soccer. One tore ACL in both knees. The other daughter just returned to training for ACL reconstruction of right knee. There is a high risk of tearing the OPPOSITE knee due to compensation. I am thinking of buying the armor force point knee brace for her " healthy knee" to prevent her from tearing it. The reconstructed knee is stronger post surgery. What do you think? I am looking at ordering the Armor or the Defiance III and have a couple questions. I am post-op ACL surgery that was successful but I want support as I never want to tear it again, and will be using the brace for motocross, snowboarding, and surfing. (1) What is the difference between the two braces, is the Defiance III just more lightweight? (2) Which brace do you recommend for the type of activities I plan on doing? and (3) Does the Defiance III provide more support? Both braces will help to prevent you from re-tearing that ACL and the braces are similar in weight. The difference is that the Defiance is a custom brace made spcifically for your knee so the fit will be better. The Defiance is a carbon fiber frame and the Armor is Aluminum. The Armor is a patient ready brace so it will fit a range of patients. Would the armor be recommended for the motion involved in squatting a barbell? I torn my acl during soccer, now i am coming back to playing again, im a goalie and i play soccer competitive so which brace is best for me to not retorn it again. I want to use it during practices amd games and be able to shoot with my leg without any discomfort. I am between this Armor brace and your Fullforce. They are very similar in price, what are the main differences? My measurements are also something I'd like to ask about. It seems as though i'd have to go with a Small to fit my thigh, however my knee center and calf are within the Extra Small specs. I'd be fine with the Small to make sure it fits my thigh, however I'm worried about the extra width in the knee center area compared to my measurement. I just don't want it to be too loose there and not provide enough support. Thoughts? I'm 6 months post ACL and Meniscus surgery and I'm getting ready to return to playing soccer. What is the best brace to prevent re-injury and ensure confidence as well as comfort? The Don Joy Armor with the fourcepoint hinge would be the best support for your knee and the frame would be the strongest for any contact that may occur while playing soccer. I am get a brace with a short calf for skiing and soccer. When it asks me for the style the choices are armor or ski armor, whar are these? I have had knee surgery on both my knees from playing soccer. My right knee has had reconstruction of all my ligaments, and my left knee had to have a surgery called fulkerson osteotomy wich is basically patellar stabilization. I want to play soccer again, but I don't want to hurt my knees again. Which brace would you recommend for someone who has had pretty severe knee injuries, and wants to go back playing at full force? I just took my measurements and for my leg that has had the ACL reconstruction (several years back) it is slightly smaller than my other knee. It is also measures right on the cusp between a small and a medium. My measurements are: calf - 13 1/2"; knee - 13 1/4"; Thigh - 18 1/2-19". Which size would you recommend as I want to make sure that the knee brace fits appropriately? I have a slight mcl tear and I play football for high school ( I'm a lineman ) what braces would you recommend? My wife has a partial tear of her ACL and bone bruising. The orthopedist said to rehab it and see if she could get back to skiing and snowboarding. Trying to choose between the Armour and the Full force but can't figure out the main difference other than your site says the Armour is best for skiing/snowboarding. Can you explain the main difference? I don't have an acl and canines with drop foot my knee hyperextends when I walk. Can the hinges be set not to straighten all the way? If so, how strong are they? I have a knee cage brace, but it's bulky and I can't sit with it, so I'm looking for alternatives for an everyday brace. The Brace comes with a 10 degree extension stop installed in the hinge to prevent hyper-extension. If you have serious hyper-extension issues you may need a greater stop or a rigid knee brace. The stops can be by a medical professional directly from us. I did the measurements recommended on the site, and it indicates that I am a large. However, I am unsure if I should account for my thigh and calf to get bigger as I do more physical therapy to strengthen my supporting muscles around my ACL reconstruction. Do you recommend going up a size? Hey I need to get ACL reconstruction surgery for a torn ACL and I compete in the sport of Track and Field, and my events are Long Jump, Triple Jump and the knee that has the torn ACL is my left leg, which ultimately is my jumping leg. I have the option to do the surgery in a month and miss a competitive season and buy the Armour brace and wear it after anyways, or my other option is to get the armour brace custom fit, and immediately start to compete and get the surgery in the off season. My only worry is that with this brace on will I be able to compete at or close to 100% in my sport? I would suggest either the Full Force Ligament Knee Brace. It is lighter than the Armor but still a very supportive brace. Another option is the custom A22 knee brace that will be a slightly better fit because it is custom. Most likely you will not be able to compete without a brace but it should not affect your performance. I need something to go under because it irritates so much I just got this Friday and practice today just made my skin burn from the straps I love it and all but it hurts trying to play softball with it having to be tight but rubbing so much, I had acl surgery may 5th I tore it in half and I just want to be comfortable and it just hurts my leg. What's the difference between the Armor and the Ski Armor styles? The Ski Armor is an older brace with our older fourcepoint hinge and the brace is a short calf with a deflector on the medial hinge to prevent the brace from hitting the opposite knee. The Armor has been re-designed with a new lower profile fourcepoint hinge so there is no need for a deflector. The brace also comes in a short calf if you need that for skiing. The hinges on my donjoy armor force point brace squeak. Would it hurt the brace if I used WD-40 to fix the squeaks? I love the knee braces but am confused about how to adjust them. In the carrying bag there are metal parts with degrees on them (30,45,60,75) where do these go? 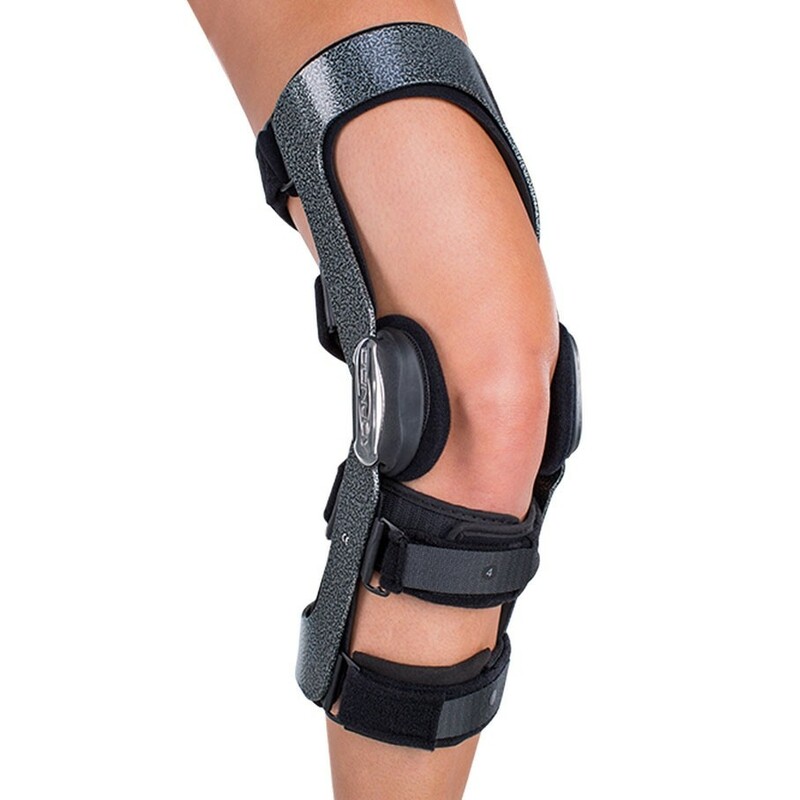 The stops that are in with the brace can be installed in the hinge to restrict motion in the knee. It is not recommended to use them unless a medical professional installs them for you and if your physician wants your knee flexion to be restricted. I had an ACL reconstruction as well as meniscus repair 3 weeks back. I had purchased a DONJOY LEGEND knee brace. Would this Brace help me protect my meniscus without damaging it further? I have the DonJoy knee brace on my left leg and wear it almost every day. and cuffs and what is the frequency of cleaning? The best way to clean one of these braces is to clean the entire brace wil mild soap and water then let air dry. Do not remove the pads and liners because then you may have trouble getting them back on in the proper place. It is up to you how often you feel you need to wash it. I had reconstruction on my ACL and Meniscus after a lacrosse accident, and my physical therapist highly recommends swimming to strengthen the muscles. I enjoy waterspouts in a lake setting, If I want to wear my already-owned Armor brace in the water is it built to work and last while being worn in the water? Yes, you wont have any issues with wearing the DonJoy Armor Knee Brace in the water. Just remember to rinse with fresh clean water and let it air dry. You may need to lubricate the hinges from time to time if you do a lot of water activities in the brace, but you can use a dry teflon lubricant to keep the hinges moving fluidly. I have a MCL injury and currently wear the playmaker brace. I was wondering if the armor brace would give a little more movement as far as for gardening and getting up and down. I have recently sprained my MCL and need to continue playing the rest of my lacrosse season. I also suffer from knee hyperextension and patella tracking issues. Would the Armour brace be a good fit so that I can reduce pain and keep playing? Why this armor is not recommended for PCL lesions? The Armor itself is okay for PCL injuries, as you can get PCL strapping. However, the fourcePoint hinge is contraindicated for PCL injuries. The fource point hinge will give resistance during the last portion of extension, which will increase force placed on the PCL to give protection to the ACL. hey, i had my acl reconstructed two weeks ago i play soccer and i want to buy a DonJoy Armour. But the problem is I'm in Thailand, can you ship the brace to Thailand? and what is the fastest way to ship an item to Thailand? My son tore his ACL and strained his MCL. He had ACL surgery but he is complaining about is MCL not being supported with his knee brace. He is very active in sports, especially football. What brace do you recommend to help support his MCL? The Armor Knee Brace with the fource Point hinge would be a good brace for your son. It will protect both ligaments and privid him support to prevent any further injury. The brace is made of a tough aluminum and is made for contact sports. The FourcePoint technology along with the Strapping system will protect the knee form re-tear of ACL . The bilateral hinges will give him support of the MCL. Based on the above measurements I would assume a Large sized brace with short calf option would be what I am after? Would this be correct? Last question, do you ship to Canada? My son is a wrestler with a torn ACL but where he feels no pain and had wrestled with it in that condition for several weeks before getting it diagnosed. Because he would like to postpone surgery until after the season, we have been directed to investigate the DonJoy Armor Knee Brae with Fource Point hinge. Would this be appropriate for a wrestler? Thank you for contacting product support. I do not believe he would be able to wrestle with the Armor knee brace on. It is a rigid knee brace made of Aluminum and either would have to padded or would be banned from wearing it at all during competition. I would check with his coaches and see what is permissable to wear during competition. Most likely he would not be able to wear anything that an opponent could grab onto. If he could wear a soft hinged knee brace, I would suggest the Playmaker available here: https://www.betterbraces.com/donjoy-playmaker-ii-knee-brace-1, but this might not even be allowed. Will the DonJoy Armor Knee Brace with FourcePoint Hinge provide support to the leg at the knee level when while walking your leg fails you and you tend to fall. The Armor with FourcePoint Hinge will provide support to the ACL/MCL/LCL. It will damper the extension of the leg when going into extension and decrease the amount of time the ACL is in the "at risk" position. You may want to look at the DonJoy Deluxe Hinged Knee Brace. This will offer you some compression as well and the hinged uprights for added stability. Thank you for your question and please contact us if you'd like any more information. I have had an ACL reconstruction and my meniscus was really bad so after. They recommended this brace and now that I have had it for a lot less than a year and have been playing in it. The straps are started to stretch and the padding is starting to get ruff and come apart. I was wandering if there was some kind of warranty for that sense it hasn't been that long. Your Brace Frame has a 1 year warranty, the straps and pads have a 6 month warranty. You can purchase replacement straps and pads at the link below. I injured my medial meniscus in HS and have reaggravated it on several occasions over the last decade. I injured it again last week playing hockey when I took impact to the outside go my leg. I would like a brace that could give me support playing a physical sport like hockey while still giving me range of movement. I have never been diagnosed with acl or mcl tears. What knee brace do you recommend? The DonJoy Armor Knee Brace is the most highly recommended for high contact/collision activities such as hockey and football. Because you have medial meniscus injuries and no ACL or MCL involvement, you probably do not need this type of rigid frame brace. We would recommend the DonJoy Reaction as more of an appropriate choice. This would allow for minimal to no limitation in your range of motion and still provide appropriate support to your medial meniscus. Should this brace be able to handle sliding in baseball/softball? And also I ruptured my acl and I currently own this brace but was wondering if the fourcepoint hinges are good for this injury or should I disengage them so they act as a standard hinge? I wanted the fourcepoint so that after I have surgery which probably won't be until November, I could use it during my recovery as well. The Armor with FP hinges would be the best product for your condition and activity level. The FP hinges are the only hinges clinically proven to protect the ACL specifically. how can i get a diagram of how the straps go on my armor forcepoint knee brace its been awile since i used it thank you. I tore my ACL a couple of years ago playing soccer and never had a reconstructive surgery. I got to the point where I am running 3-4 miles and doing plyometrics after he injury. I played some flag football yesterday for the first time since injury and had no brace on. The knee felt good sprinting and cutting but I feel a little irritation in knee today. I am now trying to get back into soccer but still a little scared and nervous. What knee brace would you recommend for playing soccer and contact sports with a torn ACL? Donjoy Armor with FP Hinges for contact sports to protect the ACL. I ride motocross and have both LCL and MCL injuries due to hyper-extension and straight legged impact. I am looking for the best support from re-injury but to also minimize discomfort when riding, running, etc. Will the fource point hinge be too restrictive when riding my bike? The Armor with FP hinges would be recommended to prevent hyperextension. The lbs. of pressure can be adjusted for functional purposes. Should you have any questions give us a call at 888-405-3251. How much does the armor brace weigh? I am 3 weeks out of ACL reconstructive surgery, and researching which brace might be best for me. My MCL was torn as well. I lead an active lifestyle, but my main concerns are walking rough, uneven terrain for my job. I also participate in watersports, some snow skiing, and coach fastpitch softball. Contact sports are a thing of the past for me. Any advice would be appreciated. The Armor Knee Brace will definitely assist in the ACL recovery and support, as well as provide stability to the knee. If contact sports are not a concern, a DonJoy Legend SE-4 Knee Brace (https://www.betterbraces.com/donjoy-legend-se-4-knee-brace-41) may be preferable to an Armor as the armor is typically used for athlete level protection..
What's the difference between the standard and short calf lenght? Is it the same performance? A shorter calf on the DonJoy Armor is recommended for shorter individuals (under 5'7) and patients who ski or ride motocross. The length of the brace has no effect on the functionality of the brace. The difference is due to the fact that this brace comes equipped with FourcePoint hinges. The DonJoy FourcePoint Hinge protects the ACL. The FourcePoint Hinge enhances the DonJoy Four Points of Leverage system by damping knee joint extension, improving the brace's mechanical performance, and reducing knee shear forces. The FourcePoint Hinge utilizes a spring mechanism to apply a gradually increasing amount of resistance during knee extension. The resistance reduces the time spent near full extension, or in the at risk position, increases the posterior load applied by the brace on the tibia to prevent anterior tibial translation, and gives patients a more natural gait by applying progressive resistance before reaching a firm end point. The resistance can start at flexion angles between 25° and 65° and engages during the last 25° of extension prior to coming to a hard stop. Five different resistance levels are available to meet rehab protocol specifications and provide comfort. The resistance can be adjusted using the supplied allen wrench to modify the set screw placement. The same wrench can be used to turn the resistance completely off by simply flipping a switch. Because the hamstring insertion angle increases and the quadriceps become mechanically disadvantaged as the knee becomes more flexed, anterior shear forces on the tibia and ACL strain are reduced. Therefore, athletes returning to sport after an ACL reconstruction who wear a DonJoy ACL brace equipped with FourcePoint Hinges can protect themselves while engaging in activities involving the run-stop-jump task. For a 34 year old to have a knee as bad as mine could only mean I rode BMX. An ACL injury without insurance in 2005 meant that I walked on a bad knee until 2007 when I finally had surgery. The doctor said my knee looked like a 50 year old mans knee before surgery. My doctor performed the surgery and all went well but I never regained the confidence that I had before my injury. I got less and less active as the years went by and my knee got weaker and weaker. I didn't have much hope for being active again and arthritis started setting in hard. Then I decided to order a DonJoy knee brace and everything changed. The moment I put it on for the first time I felt like I had never been injured. I could jump, and run, and ride my bike again. Almost ten years of not riding a bike, something that was a huge part of my life, I am back on my bike. I can't begin to explain how much better I feel. I exercise again and I am not in pain. Heck I can walk without being in pain, that is amazing to me. I would highly recommend this knee brace to anyone with a knee injury. It is comfortable and very supportive. I wear it all day without issue. It fits under my pants and is barely noticeable. Do yourself a favor and get the best. I am a believer now. it giving way AND pain free. also. not feeling sick from the pain. The brace works great! The type injury I had was, reconstructive ACL. I also tore the MCL, LCL and tore both meniscus at the same time. I do valet parking for a living and I was very scared to go back to work but, this brace gives me the support that I need. It has great flexibility and moves with great ease even after wearing it for eight hours at a time. After wearing it a couple hours I forget it's even on. There are other cheaper braces out there, but after the research I think this one it is the best one. Pros: Comfortable fit, very smooth and great Velcro that can be used time and time again. Cons: I can see how a custom brace would fit better, but the price difference is huge to make me be satisfied with the non-custom brace. After 4 Months of rehab from an ACL reconstruction, my Dr. finally wrote a script for a brace, I was hesitant at first about this brace but I felt instant relief the first time I put it on. I can walk and run without pain and finally get back to my old active lifestyle. Great knee brace and gives you confidence while recovering from ACL reconstruction! I have been wearing this knee brace for a few weeks now. I began wearing it 6 weeks post ACL reconstruction. It is a comfortable knee brace that stays in place well. I recently wore it for a 10 hour work day and had forgotten that I had it on by the time I got home. I am wearing it for hiking and while working as a large animal veterinarian. It is definitely worth the money to protect my knee and to give me the confidence needed to work with cattle and horses. I used this brace after recovering from ACL surgery and found it to be a bit hefty at times, definitely wasn't the most comfortable braces I've worn. It did give me more confidence but I found myself constantly adjusting it trying to keep it from sliding down. I've had this brace for about three months now after tearing my ACL playing basketball, and having surgery. This brace is so lightweight and comfortable that I sometimes forget I have it on. With it, I was able to complete a half marathon and get back to rock climbing, basketball, and snowboarding. I actually took a really bad fall snowboarding this year and was worried about if I reinjured myself, and the pain I was going to feel the next day, but it never came. This brace made sure my knee was never in a compromised position during my fall so I didn't get reinjured. With this brace I feel confident that I will get back to the way I was before I tore my ACL. Much better design than any cal braces I have used. I'm skiing with no ACL in my right knee(after its been repaired previously) and this is by far the lightest and most supportive brace I have ever tried. Ive lost three acl's so far and skied as much as possible without it being repaired and this brace is the true solution for me. Pros: Lightweight, durable, doesn't slip as much as other braces. This brace is absolutely amazing and it fits perfectly. The product is well made and the graphic paint job looks great. This brace keeps your knee really stable even under heavy loads and during workouts. I purchased the air condyle pads and they are not meant for working out but only for walking as I made one leak air while working out so keep that in mind if you buy them. I give this brace 5 stars.